We are hiring servers for the Dead Dog and doormen for Shenanigans for 2018. Visit our job application page to apply. The Dead Dog Saloon is a unique two story tavern featuring live acoustic entertainment in a friendly and comfortable environment. Built in 1981, the legend of the name’s origin has been a controversy since the laying of the foundation. It has been written up in the book, Weird New Jersey (the story appears on a wall on the first floor), one of the entertainers has written a song about it (Jim Maher), and most people think the picture inside the front door of the St. Bernard is the dog buried below (it’s not). Many people believe that The Dead Dog is truly a monument to a deceased canine; and rumor has it that a dog is truly buried there, but sensibilities prevent us from sharing the whole story. 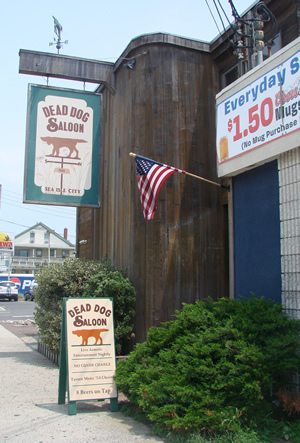 Folklore aside, The Dead Dog offers an experience not found elsewhere in Sea Isle City. The tasteful saloon features polished wood with brass accents, an antique décor, and a cozy upstairs mezzanine with overstuffed chairs and sofas. There’s plenty of seating with no need to battle for a drink at the bar. The wait staff is courteous and efficient. In addition to a vast array of cocktails, the bar has eight different draft beers and stouts on tap and an extensive craft beer selection that rotates seasonally. During the day, there is a more relaxed pub atmosphere with $2.00 chilled Coors Light mugs (no mug purchase required). The Dead Dog boasts a massive 82 inch television, perfect for watching the local baseball favorites, the Phillies. The saloon offers traditional bar fare served until closing, and prides itself on serving a proper drink in a proper glass. There is never a cover charge, but gentlemen are requested not to wear ball caps or printed T-shirts when the entertainment begins, around 9:30 p.m. Upscale casual. Pub-like and friendly; You can actually hold a conversation when the music is playing. No Smoking. Casual - No ball caps, printed T-shirts, or sleeveless shirts for men after 9:30 p.m.